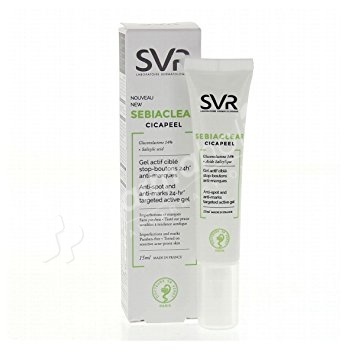 SVR Sebiaclear Cicapeel is an active gel targeted on the spots and is specially formulated for the sensitive and acne-prone skins. This concentrated fresh gel will act in 24h, by purifying, while eliminating and by drying the imperfections and located redness. Its reinforced action allows to reduce and to prevent the eventual marks on the skin. This care contains Gluconolactone associated to salicylic acid that reduce the imperfections linked to the inflammation. Formulated with paraben free, AHAs free. Tested on sensitive and acne-prone skin.